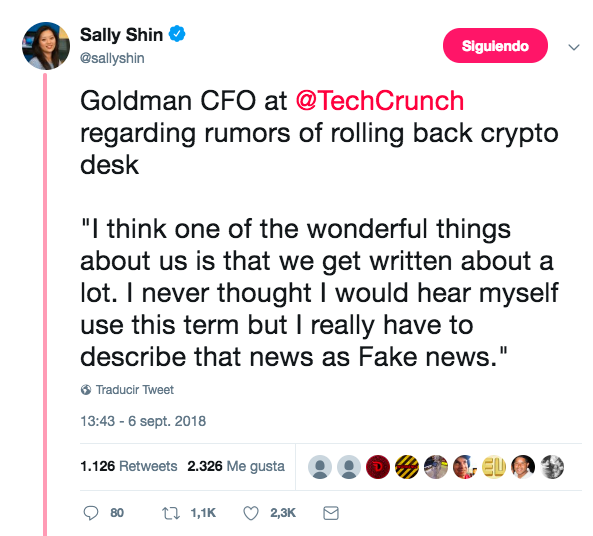 Goldman Sachs’ CFO, Martin Chavez, says that rumors about the bank dropping its plants to create a cryptocurrency trading desk are ‘fake news.’ According to Sally Shin, CNBC’ San Francisco Bureau Chief, Mr. Chavez denied the rumors of dolling back the crypto trading desk. According to Chavez, the company is exploring different options and businesses with cryptocurrencies. The investigation and investment would take time and a trading desk won’t be happening in the short-term. Additionally, he explained that the company is working on a Bitcoin derivative which would be called a ‘non-deliverable forward.’ They would be settled in US dollars and the price would be determined by several exchanges. Goldman’s CEO, Lloyd Blankfein, tweeted back in October that the bank was ‘still thinking about Bitcoin.’ Furthermore, he mentioned that the bank was not rejecting nor endorsing Bitcoin. Goldman Sachs has also been involved in the crypto market. The company has been clearing bitcoin-linked futures contracts offered by the CBOE and the CME. However, challenges still exist for the financial giant to jump completely into BTC trading. Chavez explained that physical Bitcoin is something very challenging to deal with. For example, he mentioned that the market does not have an institutional-grade custodial solution for virtual currencies. In order to start operating with the asset it is necessary to develop these solutions first. Institutional investors are not placing their funds in the market due to a lack of infrastructure. In addition to it, the market has high volatility. These are important barriers that companies need to lower down. At the moment of writing, Bitcoin has recouped some of its losses and is trading near $6500.